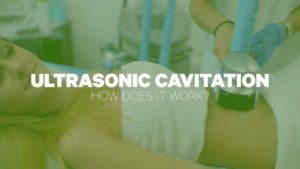 Home / Uncategorized / What Is Ultrasonic Cavitation? How Does It Work? Ultrasonic cavitation is a simple procedure that relies on sound waves to flush fat from the body instead of intensive surgery. This technique gets best results on larger areas that have 3cm more of fat such as the inner thighs, outer hips, and abdomen. This treatment is a fat reduction technique best used with a combination of treatments and is always performed as a course of treatments rather than a stand-alone procedure. For ideal results, it’s important to note that cavitation is a treatment that typically requires a course of 6 to 8 treatments performed weekly to achieve optimum results, although your therapist will advise the best treatment plan for you based on your diagnostic assessment, body type and goals. For best results, most patients require between 10 and 12 treatments in the office, but many see a reduction in the circumference of up to one to 2 inches (5 cm) after only five treatments. Each treatment session lasts around 30 to 50 minutes. To make the most of their treatments, doctors recommend drinking water, maintaining a healthy diet and exercising regularly between sessions. In fact, it is important that patients drink at least 1.5 L of water before and after the ultrasonic cavitation treatments to help the body expel the fatty acids. You are likely to be instructed to follow a low-calorie, carbohydrate diet for at least one day before the procedure, which will help you burn fatty acids better during treatment and right afterward. For many patients, a solution that offers long-term results is worth the money and extra time. Doctors who perform liposuction with ultrasound say that fat cells treated with low-frequency sound waves will not return, so they provide a permanent effect. However, it is important to maintain a healthy diet and exercise to keep fat free. Anyone with a pacemaker, heart or vascular disease or other serious condition may not be eligible for this treatment. Due to the potential for metabolic damage in the cavitation process, people with diabetes should avoid ultrasonic cavitation. The cost of ultrasonic cavitation varies greatly depending on the treatment area. For substantial savings, check our site for deals on ultrasonic cavitation treatments near you. To know the exact price and the other details about the treatment visit Personiks: Cosmetic and Plastic Surgery Clinic in Hyderabad.